MSM Capsules, or methylsulfonylmethane, is a naturally-derived sulfur formula that helps support joint functionality and comfort, specifically connective tissue health. MSM also provides potential support for healthy immune and respiratory function. † Results may vary. MSM, or methylsulfonylmethane, is a naturally occurring sulfur compound found in the cells of all living things, including plants, animals, and humans. It has been a part of the Earth’s delicate ecosystem from the beginning of time. Your body utilizes and expends MSM on a daily basis. When taken as a dietary supplement, MSM has been successful in supporting joint health, respiratory health, and various other bodily functions. One of the many advantages of MSM is that it is a small molecule with a molecular weight of 94. It is bioavailable and capable of passing through tissues. MSM is absorbed and concentrated in the roots of plants and vegetables. Humans and animals get MSM mostly from eating unprocessed fruits and vegetables, but measurable amounts of MSM can also be found in milk and meats. Although it is abundant in nature, the modern day practices of food processing easily destroys the MSM in the foods we eat. Supplementation with OptiMSM is a great way to get the benefits of MSM into your body. OptiMSM® is a branded ingredient that represents the highest quality MSM you can buy. Manufactured in the United States at an MSM-exclusive, state-of-the-art facility. OptiMSM® was the first licensed and patented MSM available for nutritional use. It also has the distinction of being the only MSM to receive industry certifications for manufacturing processes and the highest kosher status certification from the Orthodox Union. With third party testing guaranteeing purity, OptiMSM® is your assurance that you are receiving the purest, highest quality MSM available. What does OptiMSM® do for the Body? Stanley W. Jackob, M.D. is the leading authority of MSM in the world. He is a physician and surgeon at Oregon Healthy Sciences University Hospital, and has been studying the effects of MSM upon the body for more than 20 years. Dr. Jacob has successfully used MSM with over 16,000 patients, and for follow-up care, OptiMSM® is the only MSM he recommends. His research and clinical experience reveals that MSM is beneficial in supporting a variety of structures and functions within the body. Supports Healthy Joints and Ligaments. MSM has shown many positive effects in maintaining healthy joints, ligaments and tendons. It can be a useful dietary supplement to assure positive nutritional status to this key “quality of life” concern. Supports Respiratory System. MSM has shown to be an effective nutrient in the positive health status of the respiratory tract. MSM supports healthy mucous membrane tissue and helps the body maintain its natural barriers to allergens. Supports Gastrointestinal System. MSM has shown to be an effective nutrient in the positive health status of the gastrointestinal tract. 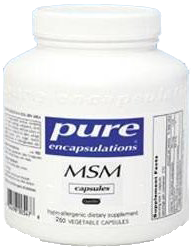 MSM provides positive support for effective digestion and nutrient absorption. 2–8 capsules per day, in divided doses, with meals. Take 2–8 capsules per day, in divided doses, with meals or as directed by your healthcare practitioner. 1. Who should take MSM? Because organic sulfur is a basic component for overall human wellness, everyone who wants to maintain a healthy and active lifestyle, especially those who are 40 years of age and older, may benefit from supplementing their diets with Supreme MSM. MSM is non-toxic and has had no reports of significant allergic reactions in the many years that it has been studied. We do recommend that you inform your doctor that you are supplementing with MSM. MSM not be used by pregnant or lactating mothers, by children under the age of two, or by persons on blood thinners such as coumadin or Heparin. 3. How much MSM should I take? Follow the directions recommended on the products you buy. Over the years, thousands of patients have experienced healing benefits by taking 2 to 8 grams (2,000 to 8,000 milligrams) of MSM a day, in 2-3 divided dosages, depending on their gastrointestinal tolerance. It is recommended that you begin with smaller amounts and gradually increase as needed. Please note that taking MSM at amounts greater than your body’s ability to absorb it may result in loose stools. If this should occur, cut back the amount you are taking. For general maintenance and health, a daily dosage of approximately 2 grams (2,000 milligrams) is recommended. Many people require larger dosages to maintain health. If larger dosages are used, the target amount should be increased slowly over a period of several weeks. Most people supplementing with MSM should take it with breakfast and lunch. Avoid taking large dosages prior to bedtime because MSM increases energy levels. Higher doses are typically necessary to experience therapeutic effects. A person suffering multiple allergic symptoms during pollen season may require more than 8 grams of MSM per day. Those with deep-seated conditions will often need even higher doses to experience relief. Under a physician’s care, a person can experiment with higher levels of MSM for deep-seated conditions. MSM is rated as one of the least toxic substances in biology and medicine, comparable to water. 4. Is sulfur the same as sulfa drugs? No. It is not the same. MSM is organic sulfur and is a nutrient. Sulfa-based drugs do not occur naturally and are used for the same purposes as antibiotics. While many people are allergic to sulfa drugs, no similar reactions have ever been reported with MSM. MSM presents organic sulfur in a form that the body can readily assimilate. 5. Why insist on OptiMSM® by Pure Encapsulations? OptiMSM® is the purest MSM available and it’s the only MSM guaranteed through third party testing to be free of microbiological contamination and heavy metals. That’s why it’s the MSM of choice for leading manufacturers of dietary supplements. Always look for the distinctive logo on the label of your favorite brand as assurance that you are receiving the purest MSM available. Many companies write the words OptiMSM® on their labels but, in fact, are using MSM that is from overseas or that does not have the reputation that OptiMSM® has obtained. 6. Why should I choose Pure Encapsulations MSM over other brands? At Oasis Advanced Wellness we require the highest of quality from the beginning of the product until it reaches our customers. Pure Encapsulations, Inc., manufactures a complete line of hypo-allergenic nutritional supplements. Their products contain absolutely no hidden fillers, coatings, artificial colors or other excipients that would disrupt or diminish the bioavailability of the ingredients. Additionally, their products are always free of wheat, gluten, preservatives and hydrogenated oils.